Approximately 5% of the population has some sort of ear malformation. Protruding ear and external ear microtia (or a variant) are the two most frequently encountered congenital ear problems in plastic surgery. The former condition is commonly treated by many practitioners, while the latter has become the bailiwick of just a few surgeons. Most of this discussion focuses on prominent ears because of their common occurrence. Otoplasty has undergone important developments, with numerous techniques being presented in the surgical literature. Congenital ear microtia and atresia is treated in only a few centers by surgeons with an established reputation, similar to the way some centers specialize in craniofacial osteotomy surgery. Examples of preoperative and postoperative otoplasty are shown in the images below. Many different approaches to setback otoplasty have been developed. Originally, the first operations were merely resection of skin from the posterior sulcus. Approximately 200 different techniques have now been described for setback otoplasty; each technique has strengths and weaknesses. Over the years, an evolution of operations has occurred, including those with and without sutures, with and without resection of cartilage, and with or without scoring of cartilage. With this many variations, no single "right" technique exists. Microtia as a modern operation was first pioneered by Tanzer from Dartmouth Medical School. Tanzer was the first to develop the technique of using a whole piece of rib cartilage to simulate the cartilaginous structure of the external ear. Burt Brent from Stanford, Calif, expounded upon Tanzer's work and has written extensively about microtia reconstruction. The expression "beauty is in the eye of the beholder" is often quoted and still quite relevant. What constitutes a prominent ear? Ray Elliot stated in his 1990 review article in Clinics of Plastic Surgery, "the esthetic ear protrudes less than 2 cm when measured from the surface of the helix to the mastoid scalp at the midpoint of the ear's length." However, once this measurement achieves a distance of less than 1.2 cm, the ear has an equally displeasing "pinned back" appearance. The ear protrudes more at the lower pole and less so at the upper pole because of the shape of the skull. The scaphoconchal angle should have a natural soft roll and should not block the view of the helix anywhere along its course when viewed anteriorly. No statistics are available on the prevalence of protruding or prominent ears. 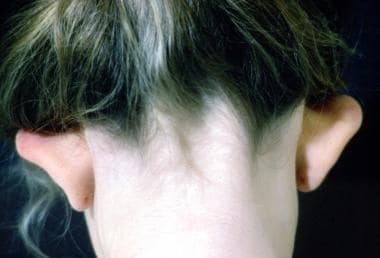 Heredity plays a role in many deformities of the external ear. Most embryologic studies of the ear focus on the development of the 6 ear hillocks. These hillocks appear around the fundus of the first branchial groove by 38 days of gestation. As the groove closes and the first and second arches come together, the primitive ear is formed by day 50 of gestation. The first 3 hillocks come from the first branchial arch and the second 3 from the second branchial arch. Absence of hillocks 2-5 produces a frequent and typical microtia. Malformations of the ear can appear anywhere during this development. Address some or all of these problems in the planning and execution of the operation to correct the abnormality. Auricular anatomy in children varies only slightly from that in adults. By the third year, 85% of ear growth and development occurs, and little growth occurs after 10 years. The ear's height may increase gradually into adulthood but its distance from the scalp changes little after 10 years. Because of this, setback otoplasty can safely be performed on children as young as 5-6 years. Most parents, while emotionally distressed when their baby is born with a portion of the external auricle missing or severely distorted, are unconcerned about protruding ears at birth. Patients tend to seek surgical opinion for protruding ear problems at two stages of life. Parents often seek medical advice for their children at the start of school because of the child's complaints of classmates' teasing. The jeer of "Dumbo" is difficult for a first grader. The second group of patients consists primarily of women in their twenties or early thirties. These patients also are embarrassed about their protruding ears. In the patient born with a prominent ear or deformity, the situation may be a little different. With the obtuse scaphoconchal angle and absent antihelical fold, distance from the helical rim varies. Many authorities believe the external ear should protrude no more than 2 cm from the surface of the helix to the mastoid scalp at the midpoint of the ear's length. This measurement is a guide and not an absolute rule. Much depends upon the patient's expectations as well as the surgeon's experience. Although congenital absence is almost always unilateral, patients with prominent ears usually require a bilateral operation. Children with protruding ears generally do well when operated on as early as age 5-6 years. A study from the Medical College of Wisconsin presented a series of 12 patients in whom otoplasty was performed before the age of 4 years with good results. [4, 5] Taunts from schoolmates begin at this time. Parents, not realizing how cruel kindergarten children can be, are often oblivious to this ridicule. Young girls reveal much less of this mental anguish because they are able to wear their hair long and cover their ears. 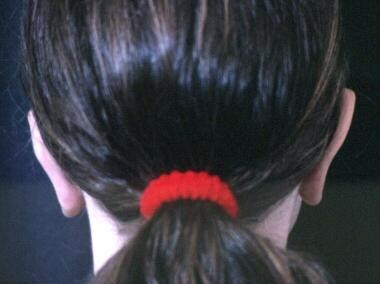 They never wear a ponytail, lest a peer discovers their ears stick out. In this author's practice, a common indication for setback otoplasty is the approximately 20-year-old woman who is getting married and now wants to wear her hair in an upswept fashion. Boys do not have that option. Because of a genetic predisposition to protruding ears, some parents find that seeking plastic surgical consultation for their children is difficult. To admit his or her child is flawed, the parent must admit he or she is flawed. The ear can be difficult to reproduce surgically because only a thin layer of skin covers the cartilaginous structure. This cartilaginous structure is attached to the temporal bone medially by several minor intrinsic muscles. A looser attachment of skin is found upon the posterior aspect of the auricle than the anterior aspect of the auricle. The vascular supply comes from the superficial temporal and posterior auricular vessels. Corresponding veins drain the ear. Litschel R, Majoor J, Tasman AJ. Effect of protruding ears on visual fixation time and perception of personality. JAMA Facial Plast Surg. 2015 May-Jun. 17 (3):183-9. [Medline]. Elliott RA Jr. Otoplasty: a combined approach. Clin Plast Surg. 1990 Apr. 17(2):373-81. [Medline]. Gosain AK, Kumar A, Huang G. Prominent ears in children younger than 4 years of age: what is the appropriate timing for otoplasty?. Plast Reconstr Surg. 2004 Oct. 114(5):1042-54. [Medline]. Gosain AK, Recinos RF. 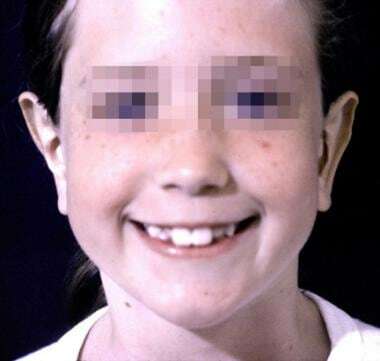 Otoplasty in children less than four years of age: surgical technique. J Craniofac Surg. 2002 Jul. 13(4):505-9. [Medline]. Janz BA, Cole P, Hollier LH Jr, Stal S. Treatment of prominent and constricted ear anomalies. Plast Reconstr Surg. 2009 Jul. 124(1 Suppl):27e-37e. [Medline]. Furnas DW. Complications of surgery of the external ear. Clin Plast Surg. 1990 Apr. 17(2):305-18. [Medline]. Oliveira MM, Oliveira DS, Oliveira GS. The Existence of a Natural Plica at the Anatomical Base of the Antihelix and its Surgical Importance to Address Protruding Ears: An Anatomicosurgical Study. Aesthetic Plast Surg. 2017 Apr. 41 (2):321-6. [Medline]. Matsuo K, Hayashi R, Kiyono M, et al. Nonsurgical correction of congenital auricular deformities. Clin Plast Surg. 1990 Apr. 17(2):383-95. [Medline]. Erol OO. New modification in otoplasty: anterior approach. Plast Reconstr Surg. 2001 Jan. 107(1):193-202; discussion 203-5. [Medline]. Taboada-Suarez A, Brea-Garcia B, Couto-Gonzalez I, Vila-Moriente JL. Correction of protruding ears (Weerda grade I deformity) using knotless bidirectional barbed absorbable sutures. Otolaryngol Head Neck Surg. 2014 Dec. 151 (6):939-44. [Medline]. Bauer BS, Song DH, Aitken ME. Combined otoplasty technique: chondrocutaneous conchal resection as the cornerstone to correction of the prominent ear. Plast Reconstr Surg. 2002 Sep 15. 110(4):1033-40; discussion 1041. [Medline]. Obadia D, Quilichini J, Hunsinger V, Leyder P. Cartilage splitting without stitches: technique and outcomes. JAMA Facial Plast Surg. 2013 Dec 1. 15(6):428-33. [Medline]. Strychowsky JE, Moitri M, Gupta MK, Sommer DD. Incisionless otoplasty: a retrospective review and outcomes analysis. Int J Pediatr Otorhinolaryngol. 2013 Jul. 77(7):1123-7. [Medline].